We had a late-breaking problem with the cloud image and some drama with desktop wallpaper and with booting KDE on ARM, but the various groups involved in release logistics wrangled solutions and workarounds, so at today’s “Go/No-Go” meeting, we approved the Tuesday release. If you’re curious, see the meeting minutes for the process that Fedora goes through to make sure the release is ready. In any case, come back next week for download details! Wednesday: free night for teams and informal meetings (possibly with board games later in the evening — see below). Need ideas on where to go and what to see? Fedora hacker and Rochester resident Ralph Bean offers a helpful blog post highlighting ten things to do in the Flower City. Thursday: The Strong National Museum of Play, with reception at the Boardwalk Arcade. Friday: Reception at the George Eastman House International Museum of Photography and film. Also! Board game night, either Wednesday or Saturday night (still waiting on details). Read Ruth’s mail for more details. Hope to see you there! Earlier this week, Mozilla reported a serious Firefox vulnerability, with a nasty exploit found in the wild. We have an update in testing, and that will be available soon — a prompt update is recommended. Petr Hracek and others have been working on a new website for software developers doing their work on Fedora (as opposed to developing Fedora itself). Check out the prototype version, and read Petr’s blog entry on the why and who. Next week is Flock, of course, and I’m planning on skipping 5tFTW and talking to human beings face-to-face instead. The next week is LinuxCon, and I’d love to see you at my talk, Connecting Vision to Action in a Community Project on Tuesday, August 18 at 4pm. It’s not about Fedora specifically, but I’ll be viewing things through a Fedora lens and giving Fedora examples. 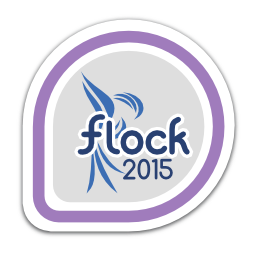 I’ll try to post a 5tFTW that week sometime, with notes from Flock and LinuxCon and the F23 Alpha — but no promises! After that, for the rest of August, I’m on vacation, visiting my family and friends in the Pacific Northwest. I’ll likely be offline for good chunks of that — for emergencies, contact Paul Frields — or any member of the Fedora Council. Hope to see many of you in person soon at one conference or the other, and then back online in September! Not sure if this is a valid question but what can we expect in Fedora 23 in terms of features, improvements? I’d just like to thank the people working on Fedora; I’m seriously having a great experience right now with F22 to the point that for the first time I don’t really feel that “rush” in upgrading to the latest available version. Another question I had on my mind for a while is racket (http://racket-lang.org/) being missing in both Fedora and RPMFusion. I’ve never fiddled with building RPMs myself so… been wondering if there’s a way to request it. Take a look at our draft talking points for Fedora 23 for some of the things to be expected. It’s still some time off, though, so as the message at the top of the page says, it’s still work in progress and there may be significant changes. I’m glad you’re enjoying F22. As for Racket — looks like there’s some effort here, but it looks like it’s been a somewhat arduous process. I notice that there is a Copr repo for racket, but I’m not sure of its quality, and it doesn’t look to have been updated for f22. It would be useful to know how to verify this is really fixed. I s there a way to enable the two Notify me* options below without adding a new comment? I’ve noticed that you are now enforcing stricter passwords. I’m not sure that’s a great idea because there are people that I have installed Fedora for that use a 4 letter/number password. My grandmother is one of them. They’re used to their passwords and it’s going to be very difficult to get them to change this. I liked what you did before, just warn people that the password is weak. Enforcing anything is a form of control. People aren’t going to like it, especially from an OS that promotes freedom. I also will not login to Microsoft because of the complexly of the passwords required by them. The main thing I doǹt is you cannot use old passwords. Im a long time linux user and loved and used fedora core2/3 and then stopped when things were getting very buggy. I think mandrake 10.1 was the best linux ever and then kde 4 happened and everything went south, things got even worse when gnome 3 development started. Been using xfce for a really long time. Ultimate Edition picked up where mandrake left and for some time bought closure. Now Im back to fedora and finding a hard time and no excuses trying to use anything else. Great work guys and I totally love gnome-shell. Kudos to the Fedora and gnome team for a tight integration.